If you are into cryptocurrencies, today’s topic might be fascinating and insightful to many of you. I am sure you must have heard of Tether (USDT), others may have used it too. For the first-timers, USDT is a USD backed stablecoin or crypto that started with the promise of being 1:1 in USD: USTD and to act as a haven against the wild volatility from the crypto markets. But did you know USDT has questionable ways of working and is very far from its original goal? One of the main controversies surrounding Tether is that it is not open to regular audits and has no proper process in place to prove that it has sufficient USD reserves. Moreover, frequent pumps and dumps of Bitcoin have coincided with large amounts of USDT being printed which doesn’t seem like a coincidence, at least to me. Plus, their close connections with Bitfinex is no secret anymore. So all this calls forth to have another fiat backed stablecoin which is fair and auditable to put an end to seemingly market manipulation tactics carried by the USDT & Bitfinex. 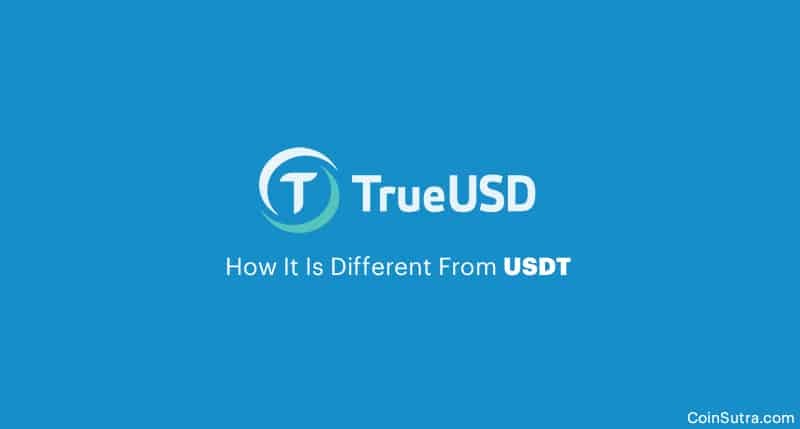 That’s why in this article, we will do a fundamental analysis of a new stablecoin – TrueUSD (TUSD) – and see how it is better and different from USDT. TrueUSD uses multiple escrow accounts to reduce counterparty risk and to provide token-holders with legal protections against misappropriation. It is also the first asset token built on the TrustToken platform-which is a platform to create asset-backed tokens that you can easily buy and sell around the world. For example, gold to gold tokens or dollar to dollar tokens can be made via the TrustToken platform. 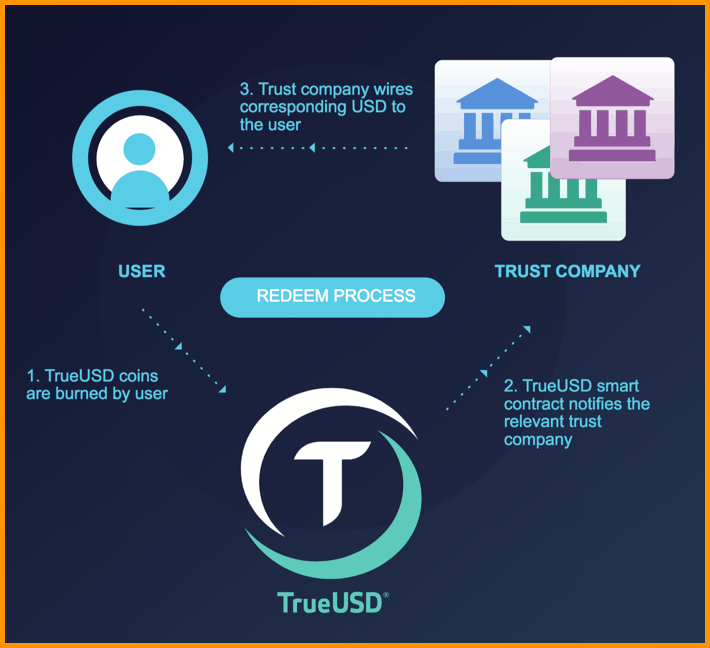 There are mainly two processes involved while using TrueUSD, one is the purchase of TUSD, and the other is redeeming of TUSD. For this, TrustToken works with multiple trust companies that already manage billions of dollars. And here the user is required to mandatorily pass a KYC/AML check after which one can send USD to a trust company to enter an escrow agreement. 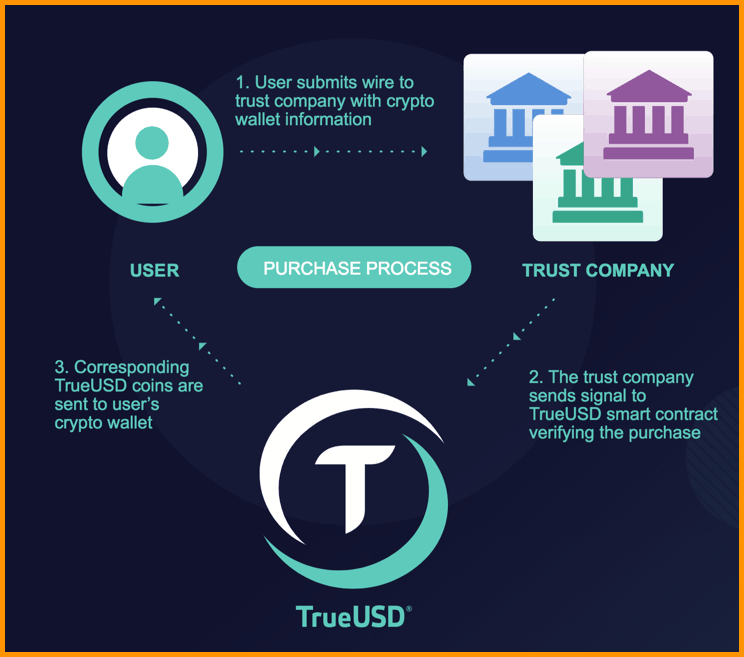 After the verification of the funds, their API instructs TrueUSD’s smart contract to issue the equivalent TrueUSD to the user’s public Ethereum address. To redeem USD, one needs to pass a KYC/AML check and then send the smart contract, your TrueUSD tokens, from a registered Ethereum address after which the escrow bank will send you funds in USD. This way, the TrueUSD system does not touch the funds, and the trust companies do all purchase and receipt of user’s money through escrow accounts. 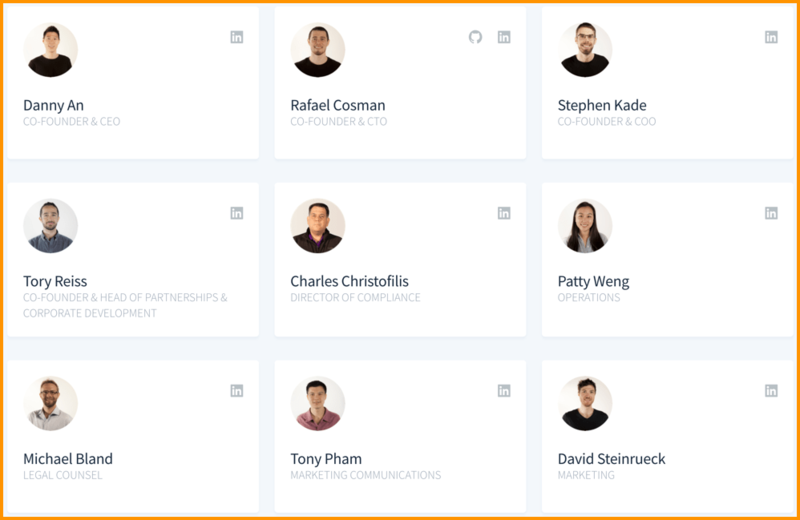 The founding team comprises of real people who have worked previously with Google, PwC, and UC Berkeley. Plus, they are getting the required traction by doing the right legal framework that they have made. #1. TrueUSD is backed by the US dollar, acting as a stable currency for digital exchange. #2. Anyone who passes a standard KYC/AML check can redeem TrueUSD for USD. #3. Every TrueUSD is always 100% collateralized by USD, held in professional trust firms’ banks. #4. The bank account holdings are published regularly and subject to monthly attestations. #5. Regular independent third-party evaluations by leading auditing firms for best security practices. #6. Transact directly with the trust firm’s bank. The TrueUSD system never touches the funds. To purchase and redeem TrueUSD for USD: the larger of 10 basis points or $75. 10 basis points on transactions of TrueUSD between Ethereum wallets. There is no upper limit cap on the supply of TUSD tokens as the concept is to issue 1:1 USD pegged ERC20 tokens. That’s why as of now, according to CoinMarketCap, the total circulating supply of TUSDT is 43,523,903 TUSD, and the current price of each unit is $1. That values it at approximately $43 million (at the time of writing this article). TrueUSD is different from Tether in its implementation and management. Here are the features that are missing in Tether but present in TrueUSD, which makes it the first choice. Legal Protection With Escrow Accounts: Escrow accounts are one of the most widely used legal vehicles for managing other people’s money, and it enables regular attestations and strong legal protection for token holders. Full Collateral: Every TrueUSD is always fully collateralized by USD, held in a professional trust company’s escrow account. TrueUSD’s publicly audited smart contracts mint TrueUSD when USD clears the escrow accounts and burns TrueUSD when USD is redeemed to ensure a 1:1 parity between the TrueUSD in circulation and the USD in the escrow accounts. Regular Attestations: The escrow account holdings are published regularly and subject to ongoing professional attestations. Here is a recent example of attestation by Cohen & Company. And these things are missing with Tether. They also plan to tokenize other assets such as TrueEuro, TrueBond, TrueYen, and stable baskets of tokenized goods (including precious metals and real estate) all of which can be listed on exchanges around the world for skilled global trade. Lastly, there could have never been a better time to launch a stablecoin like TrueUSD when we see a decreasing trend of trust in USDT. After all, we should diversify in the stablecoins too.